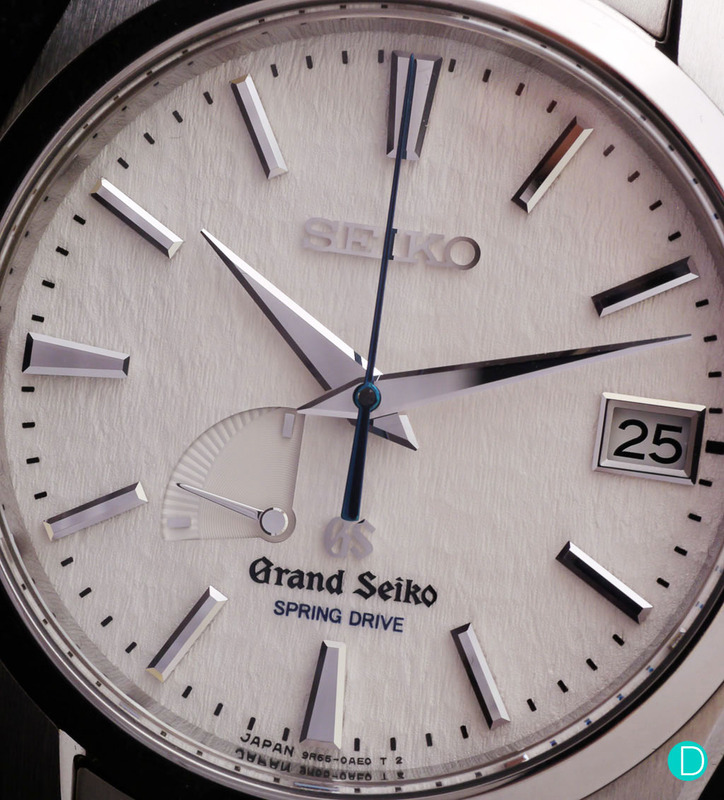 Our Chief Technical Elf writes about her beloved Grand Seiko Spring Drive. 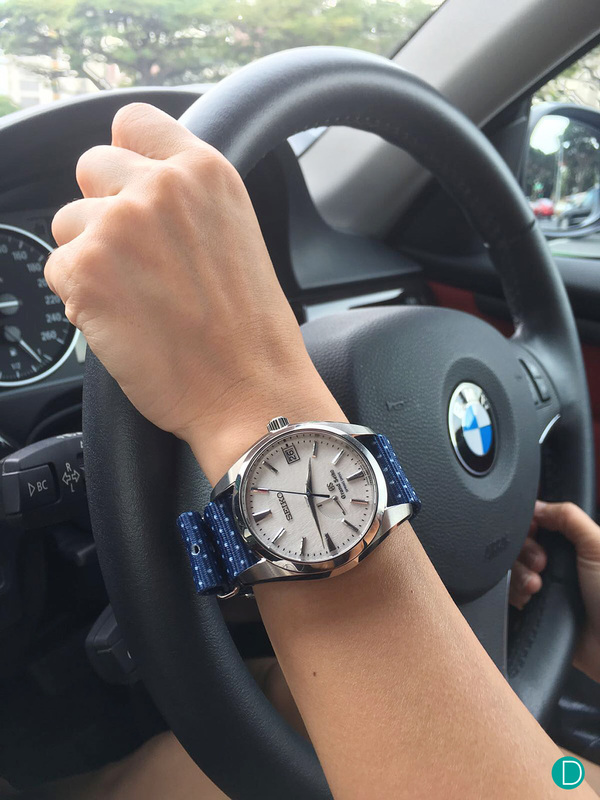 The Grand Seiko Spring Drive SBGA011 has been written about everywhere, so we are not going to replicate with a full review, but one seen through the eyes of a collector, and what piqued her interest. 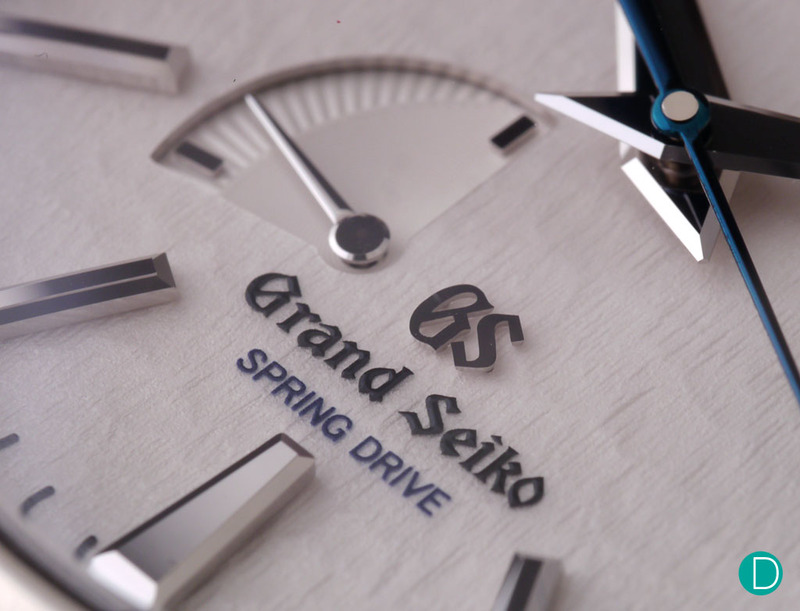 The Grand Seiko Spring Drive SGBA011 Snowflake. 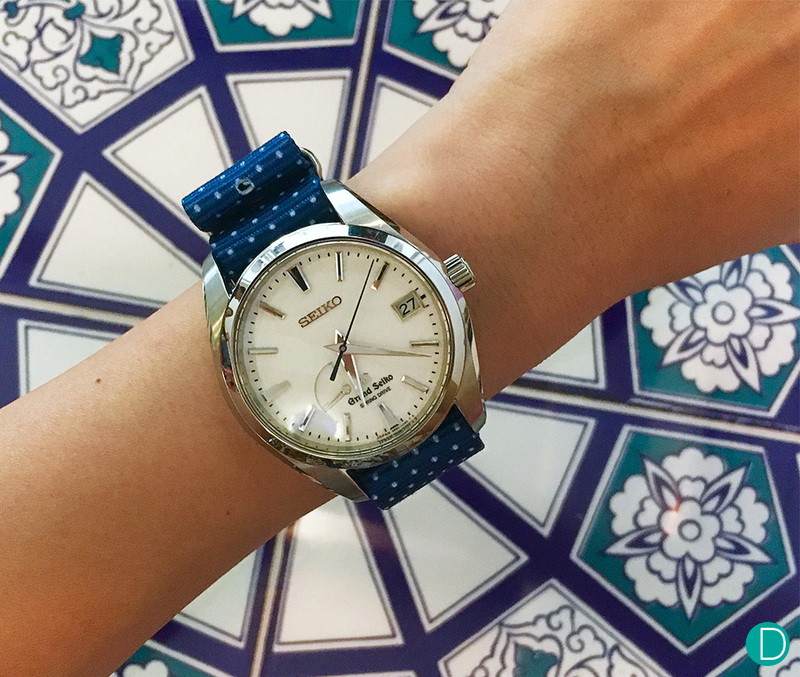 There’s just so much to like about this watch. Its simplicity and complexities, its softness and toughness. It’s really difficult to find a good place to start talking about this watch. 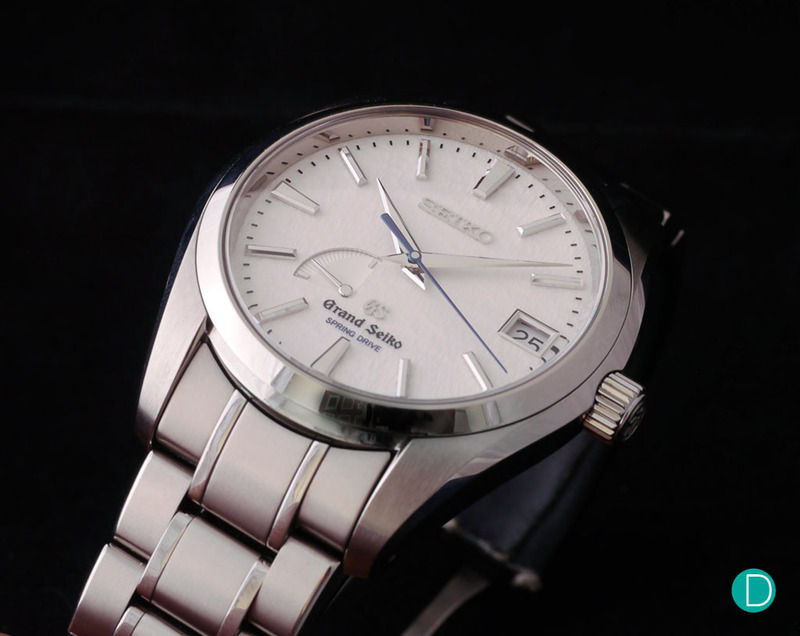 Unlike famous brands such as Rolex, Grand Seiko isn’t a brand that the mass market appreciates. 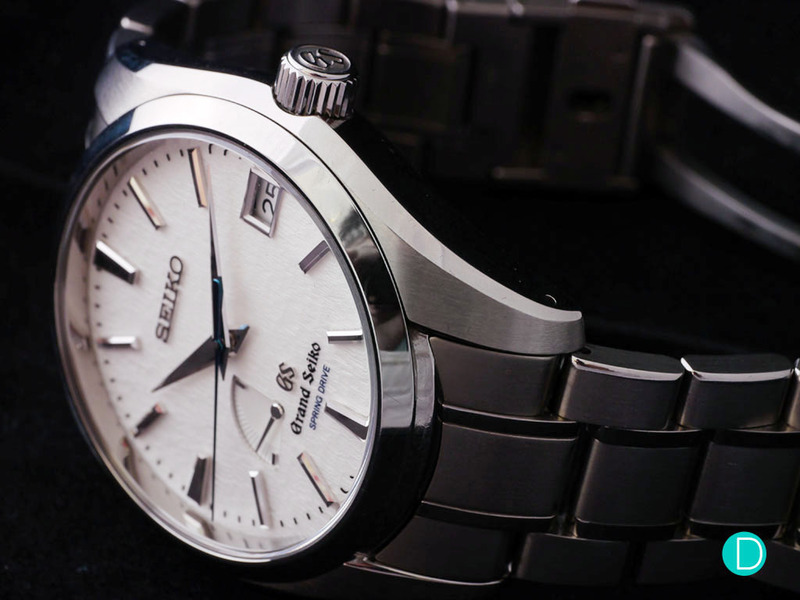 It takes some research and observation to notice the technology and nuances that make a Grand Seiko what it is. Those hands are superb. 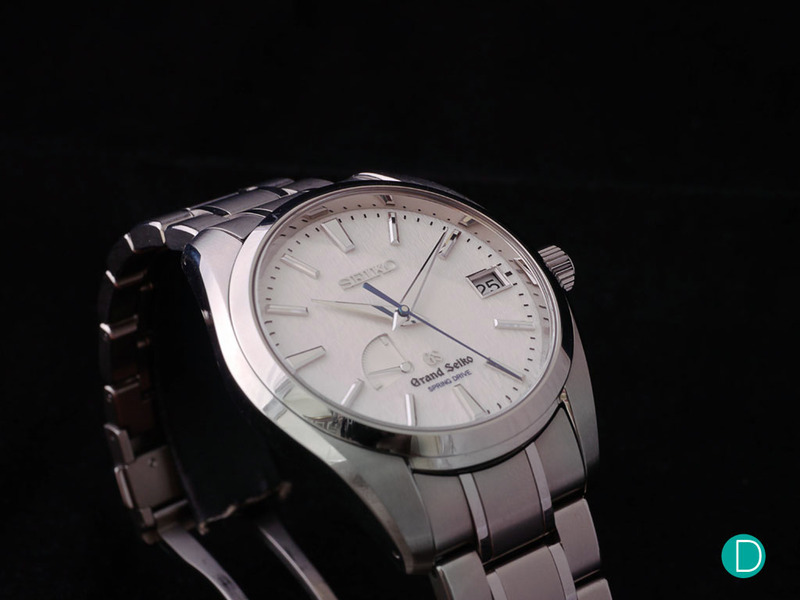 When I first picked up a Grand Seiko at a Seiko boutique (Vivo City), I was thoroughly impressed by the dauphine hands. There is something about the shape and finish of the hands that captivates people and gain nods of approvals from perfectionists. 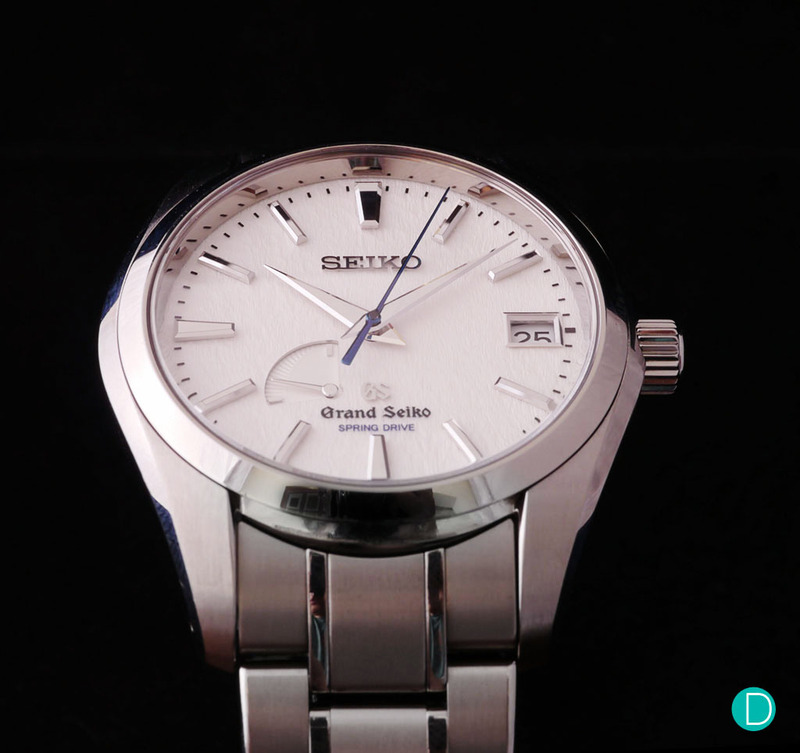 In fact, I didn’t considered Grand Seiko to be a high-end watch back then (we discussed their brand image here) until I held a Grand Seiko in my own hands and took a good look at the finishing. This distortion-free mirror finish is achieved by Zaratsu technique, a polishing technique used traditionally in the polishing of fine japanese swords. More recently did I find out from the Editor that even the underside of the hands are polished. That’s how meticulous these watchmakers are. As with most finishing processes, there is absolutely no room for mistakes, or the entire component would have to be tossed out. Hence this process is entrusted only to the most experienced and skillful craftsman. Distinct dauphine hands and its unmistakable mirror shine. The Zaratsu technique requires holding the part against a rotating tin disc. Before I forget, this is actually a titanium case, which is harder than stainless steel. This also means that polishing it is going to be extra tough. Difficult as it already is for a flat or mildly convex surface, imagine having to do this for a sharp convex profile such as the inside of a bezel. Any misses and the corners would be rounded off, or have a bezel that’s not perfectly circular to fit the dial and crystal. Zaratsu polishing on the inside of the bezel, case and also bracelet links. Other parts that use this technique includes the case, indices and the often overlooked bracelet detail. This piece has been through some awesome days with me, and there were already some swirl marks on the case and bracelet by the time these photos were taken. Back when I first saw Grand Seikos, I was undoubtedly impressed but those that I first saw did not appeal to me aesthetically. The dials were either too plain or overly motiffed for my liking. I also thought the size was definitely too big, and the bracelets too bulky on me. It took me a pretty long time to learn how to wear bigger-than-wrist watches without looking like I’m wearing a desk clock. Quick style tip for ladies! 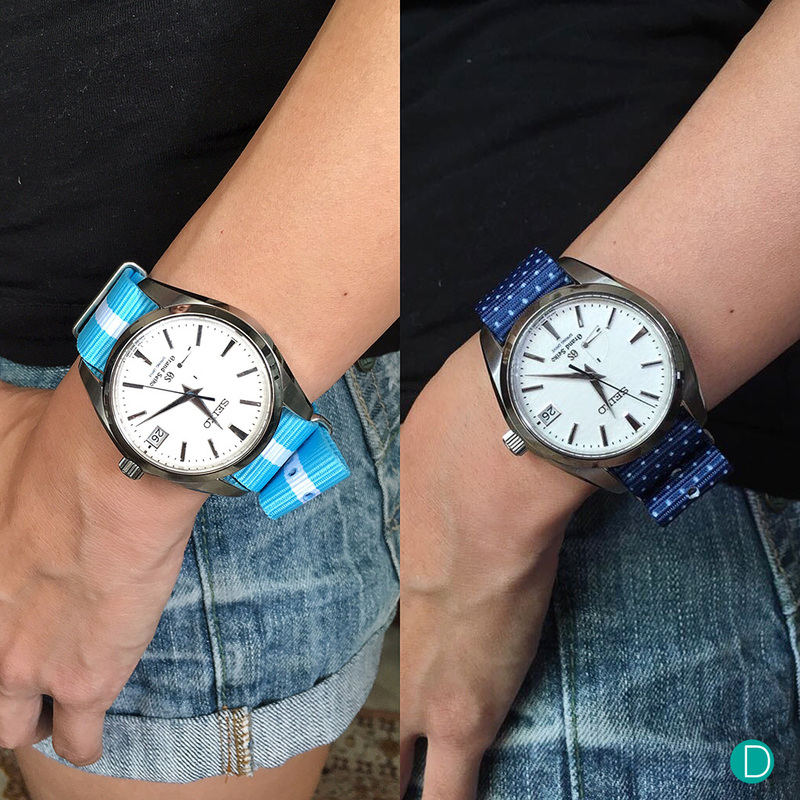 Instead of dressing up men sized watches and look like you have a belt buckle on your wrist, dress them down instead with colourful NATO straps to match your OOTD. For this delicate piece, go all white to mimic pure snow. So when my interest in Grand Seikos got rekindled and I found this Snowflake dial, I was completely sold. With every watch that I hold, the first question I would ask is “how did they make this?”. To create this dial, a brass wafer is stamped and then trimmed to size. Our guess is that the trimming location is somewhat random on a larger wafer, which is how every watch gets an unique dial. After which, each dial is cleaned, painted and polished by hand. Affectionately nicknamed “Snowflake” by the designers themselves for its close resemblance to the snow outside their workshop.The workshop of the Grand Seiko is located in Suwa, in Nagano prefecture, where the snow is light and fluffy due to low humidity. The wind then sculpts freshly fallen snow into an undulating snow scape which the Snowflake dial is designed upon. (This is also the place where they create exquisite Credor watches. Details of my personal favourite can be found here.) From afar, it looks like a simple white dial which goes with most business wear. On closer look, the ridges of the dial shows up and invites you to come even closer to watch the texture play with light. Despite its simple looks, the movement it hides is far from simple. 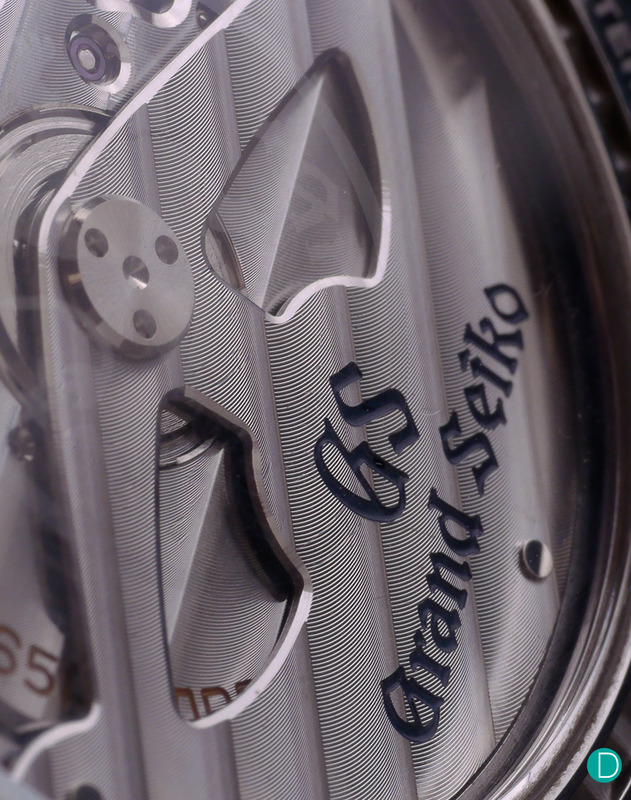 Grand Seiko’s proprietary Spring Drive powers this piece. This ingenuity started long ago in 1977 and took about 11 years for Grand Seiko to finally reveal a production piece at Baselworld 1998. Naturally this became the center of attention for its innovativeness and performance. Being the engineer that I am, I practically dissected every single step in this deceivingly simple movement. While many before me have simplified it to a hybrid of mechanical movement with quartz accuracy, I want readers to have a blow-by-blow account of how the Spring Drive movement achieves the best of both worlds. In as few words as possible, here goes. Rotor spins. Main spring loaded. Main spring turns magnetic glide wheel as it unwinds. Rotating glide wheel powers dynamo, producing tiny electrical current. Current powers up 3 things: integrated circuit, quartz oscillator and electromagnet. Integrated circuit compares glide wheel speed (target 8 revolution per second) to quartz oscillator (32786 Hz) speed. Integrated circuit tells electromagnet to apply electromagnetic brakes on glide wheel to keep in time with referenced quartz oscillator. Regulated glide wheel moves transmission to move second hand in sweeping motion. The feedback loop that I’ve described is actually the Tri-synchro regulator which replaces the conventional escapement. This movement is truly ahead of its time. In relatively recent history, we see the invention of movements such as Co-axial by Omega, blade oscillator by Dominique Renaud and the unrevealed new oscillator by Zenith. All of these variations still rely on the fundamental basics of mechanical harmonic motions, controlling the precise frequency of mechanical oscillation that translates into time keeping. Even on the author’s small, feminine wrists (about 5.25″ in diameter), the SBGA011 looks well balanced. Some people argue that the Spring Drive is simply a quartz movement, but it is not. It may be considered as quartz referenced, but the movement is definitely mechanically driven. 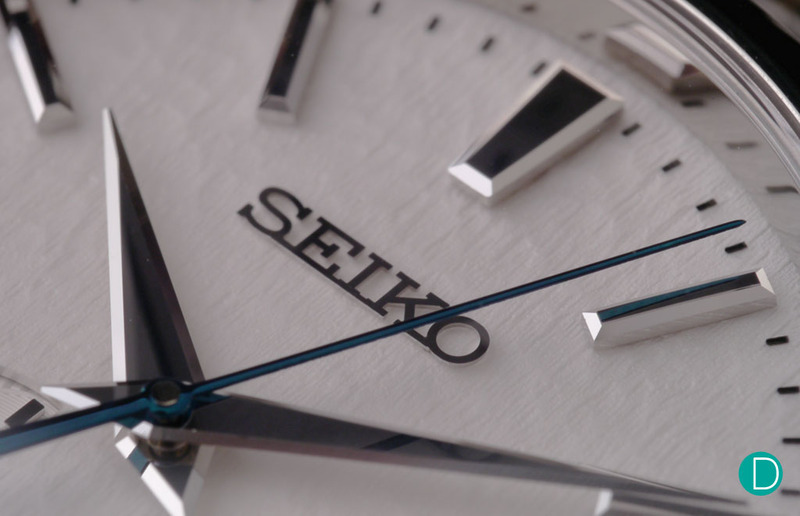 Also worth noting is that Seiko grows their own quartz crystal. 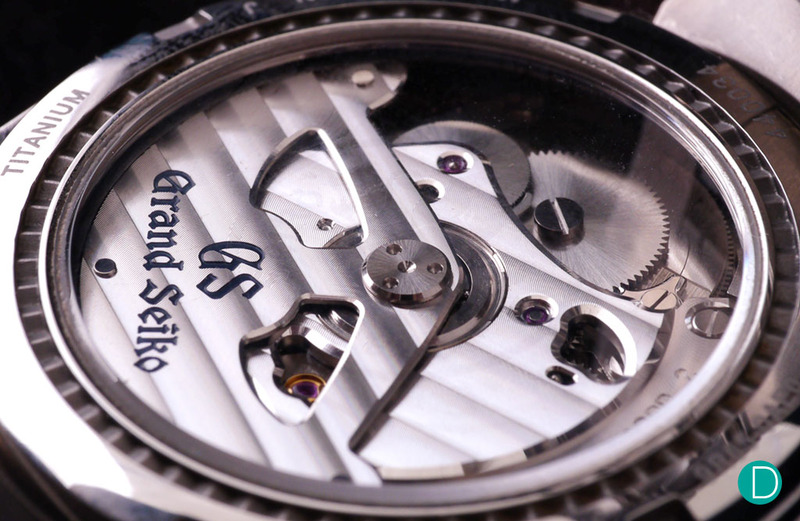 Obviously the highest quality crystals goes into their Grand Seikos and Credors, which is how a fine watch such as this achieves and maintains its accuracy. Dressed down with a suitable NATO strap, the SBGA011 looks equally as nice as it does on the bracelet.